The plays that you create in FastDraw are automatically saved to your computer's hard drive in a save file. The location of your save file will be C:Users/FastDraw Files, and your save file will be called "Master.fdb". This file can be renamed like any other file on your computer, but the ".fdb" extension must remain the same. In addition to your FastDraw save file, the FastDraw Files folder also contains a Local Backup folder. This is where your software saves automatic backups of your library, and can be utilized to recover your plays if your save file is ever lost or damaged. If you need to recover missing plays from your play library, please follow the steps in this article. Your plays in FastDraw are saved locally in a file on your hard drive, making your work susceptible to hard drive crashes or theft. Frequently syncing your library to our cloud server prevents you from losing your file, and can easily be downloaded to a new computer if you experience a crash, theft, or move to a new job. With your FastDraw license, you have the ability to use FastDraw on unlimited computers or iPads (with an iPad subscription) for one user. Sync is the best way to access your play library on each device and save all of your changes. The Sync button can be found at the top of the FastDraw window. When you click the Sync icon, you will see the Sync to Cloud menu appear. Use the Note section to add a note about your Sync, such as what computer you are saving from, and or what plays or sets have been added to your library. This will help identify the file on our server. The play library on your computer will be uploaded to the cloud server, and added to your existing file on our cloud if there is one already. 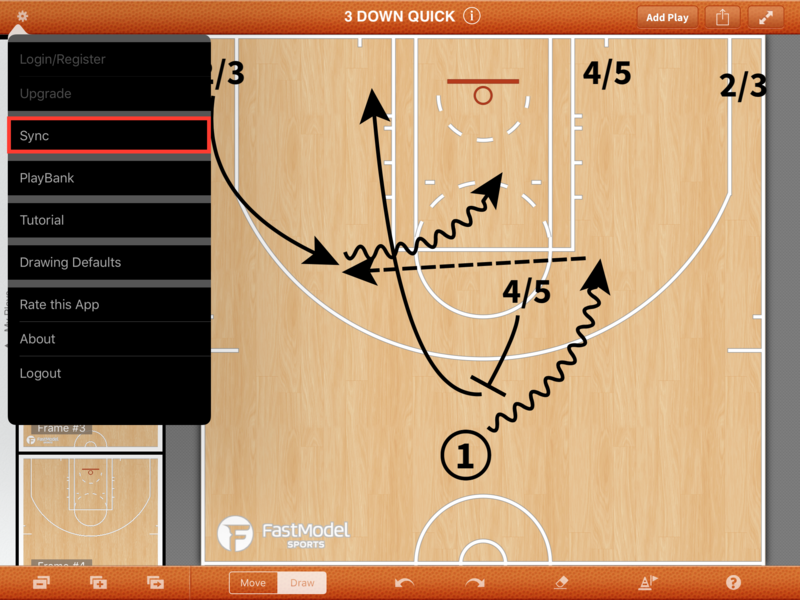 Once the upload is complete, FastDraw will check to see if any plays from the file need to be downloaded to your computer, such as plays that you created on a different computer or iPad. If so, these plays will be added to your computer's local play library. The Sync feature works the same way on the iPad as it does on the computer. You can access the Sync option by opening the Settings menu in the FastDraw app, and then selecting Sync. When you start FastDraw on your computer or iPad, use Sync to download changes from any of your other devices. When you finish working on your new plays, click Sync to save your changes to the cloud. These changes can then be downloaded on your other devices in the same manner. The Sync feature uses time stamping to check for any changes that you have made to your save file. If your computers or iPads have widely differing times set on the system clock, you can experience some of your changes not saving correctly. Please make sure that your clock on your computers or iPad are all set with the same correct time.